Good Morning my sweet creative friends! I hope you ALL had a FABULOUS Christmas! I have a few things here for you today! Let's start off w/my tag here, it is my turn to post over at Miss Jinger Adam's blog today! You can see more pics HERE! For my next 3 projects here, I just wanted to share w/you a few items that I threw together for Christmas gifts! For this first one here, since this was for my Dad who is VERY HANDY, I thought this was PERFECTO for him! 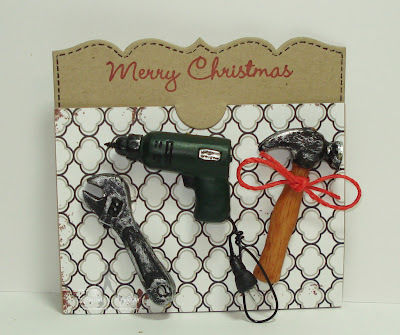 I put a "Home Depot" gift card in here using my "Gift Card Holder Die" & decorated it w/some cute mini tool ornaments that I had picked up from Hobby Lobby! I knew FOR SURE these would come in handy! ;) The sentiment came from "Gift Card Sentiments". 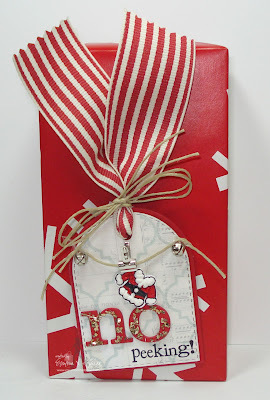 Last, but certainly not lease, remember these tags I made HERE during my 12 days of Christmas? Well, I made these to put on all of my boys presents this year & I just wanted to show you how CUTE they looked on the actual gift! These are my FAVORITE Christmas tags I've ever made by far & the boys saved them all! They were VERY HAPPY w/them too! Okay, that is it for today my sweet friends! Don't forget to visit Miss Jinger Adam's blog HERE to see more pics of my tag I made today for her! ***Just an F.Y.I. my AWESOME sale is STILL going on! Yep, there are OVER 50 stamp sets on sale right now! Go HERE to see if there are any favorite stamp sets that you have on YOUR wishlist! When you go to the sale page HERE, there is a "View All" button (to the right), make sure you click on that so you can see ALLLL of the stamps on sale right now! Just a litte FYI, there are "LIMITED" quantities available & I will NOT be offering any sale items for pre-order & I will NOT offer any "Rainchecks" once they are gone! You make want to take advantage now while I still have some on hand! This is an end of the year sale to make room for LOTS of NEW BEAUTIFUL Stamps & Dies I have in store for all of you! Now onto some EXCITING news, my FABULOUS design team & myself are starting sneaky peeks TOMORROW~ Friday, Dec 28th thru Sunday, Dec 30th w/a BEAUTIFUL release Blog Hop on Mon, Dec 31st @ 8am! 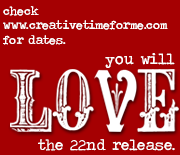 I am WAY EXCITED to share what I've been working so hard on to perfection just for you! I will ALSO be having an EXTRA SPECIAL & not to mention VERY TALENTED "Guest Designer" that you do NOT want to miss! Hope to see you all there! Your tags and gift card holders were simply adorable! We had a very small Christmas but I made cards and gift card holders using your stamps and dies. I have vowed to start a different card a month, hopefully a few of the same, and have my Christmas cards ready for next year, I really slacked this year and started them at the last minute, shame on me! You inspire me to do better! So I hope I can fulfill this! WOW Emma your gift card holders are amazing I am always in awe of what you come up with and can't wait 2 C what your next creative idea will be you are so stinkin' talented!! How perfect are the tools you found to go on your Dad's card? Your Dad is super handy too. 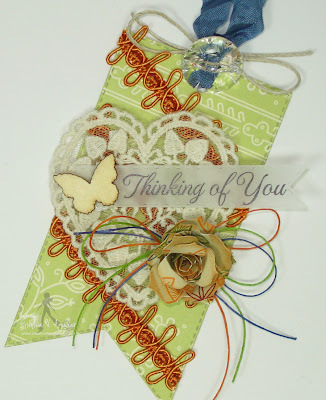 The Thinking of you tag is beautiful with the lace and flower. 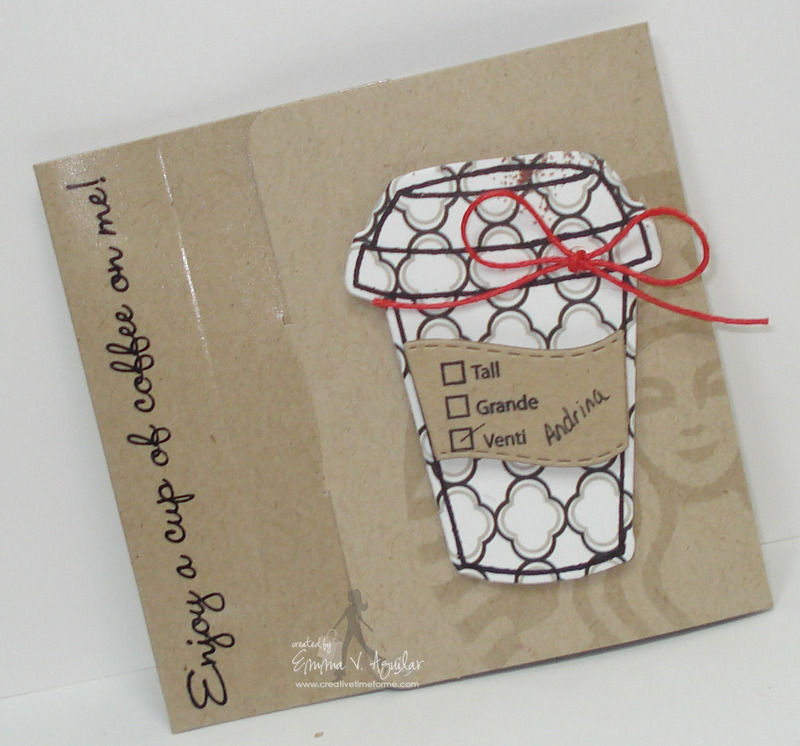 The paper you chose for the Starbucks card gives the tag some zing on the pretty kraft paper and No Peeking is too cute. All are great projects! OMG, those little tools are the cutest! Your dad must have loved that! Great idea to use the premade Starbucks gift card holders and then decorate them too! Love it all!!! What gorgeous projects Emma!! LOVE the tools....so cute!! Beautiful creations, as always... Especially the no peeking tag. These are all so beautiful and creative. I am sure they were all so well received. Great job.